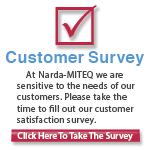 L3 Narda-MITEQ's Logarithmic Amplifier product line includes: Detector Log Video Amplifiers (DLVA), Successive Detection Log Amplifiers (SDLA) and True LOG Amplifiers (TLA). Log Amplifiers are an important part of almost all radar and ECM systems, where they are used to convert a wide dynamic range input power to an output voltage that increases linearly with increasing input power. L3 Narda-MITEQ has just introduced a new 2-6 GHz Surface Mount Logarithmic Amplifier, model MLS-0206. 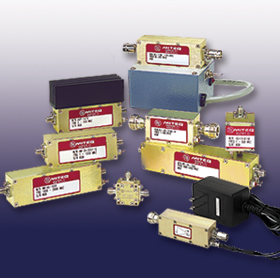 L3 Narda-MITEQ offers several types of Logarithmic Amplifiers in order to address different system applications. The successive detection log video amplifier (SDLVA) offers a wide input dynamic range, superior pulse fidelity, exceptional log conformance (commonly known as log linearity) and a limited IF output. The detector log video amplifier (DLVA) offers a broad operational frequency range, excellent temperature stability and similar log characteristics. Typical indication of the performance of a logarithmic amplifier is the measurement of the log transfer function. This is accomplished by the use of computer controlled test equipment, in which the output of an RF signal generator is stepped over the input dynamic range of the unit under test. The computer then records the log amplifiers video output voltage taken from a digital multimeter and calculates the slope and deviation from a best-fit straight line using a least-squares method. The result is a plot consisting of the measured video output voltage and the log conformance deviation in dB. Another indication of a logarithmic amplifier's performance is its ability to accurately measure pulsed-modulated RF signals. Typical pulse measurements include rise time, fall time, settling time and recovery time. An important part of accurate pulse measurement is the measurement test setup. It must be able to provide an extremely high on-to-off ratio of the pulse-modulated RF source, and be typically 10 dB greater than the dynamic range of the unit being measured. The setup must have adequate rise and fall times several times faster than the unit under test as well. Carefully matched input and output impedances are essential to ensure that mismatches do not contribute to distortion of the measured pulse response. The test set is initially calibrated using a CW signal at the highest input power level of the log amplifier under test. The pulse modulation is then applied to the input of the log amplifier. The video output is measured on an oscilloscope with a bandwidth at least twice that of video bandwidth of the log amplifier. The full dynamic range video pulse response is displayed and the corresponding measurements are taken. Using either an internal or external step attenuator, the RF level is then lowered until the pulse plus noise is just above the output noise of the log amplifier. The level measured is known as tangential sensitivity or TSS.